The Fort Gratiot Lighthouse | History and Restoration New Video! The newest county park is home to the oldest lighthouse in Michigan! The five-acre retired Coast Guard Station property was officially transferred to St. Clair County Parks from the United States Coast Guard in 2010. The Fort Gratiot Light Station is located next to the new Coast Guard Station in Port Huron and includes the Fort Gratiot Lighthouse (1829), which is the oldest lighthouse in Michigan. The Light Station also includes the Light Keeper’s Duplex (1874), Fog Signal Building (1900), Single Keeper’s Dwelling (1932), former Coast Guard Station (1932), Equipment Building (1939), and a three bay garage (1990’s). The agreement with the Federal Government requires St. Clair County Parks to oversee the restoration of the site, following the Historic Structures Report. The report is a guideline for how the site should be restored, beginning with the light tower. Following the report, restoration of the tower began in the fall of 2011 and was completed in the spring of 2012. The Port Huron Museum is responsible for tours of the lighthouse, which are available May through December. For information on tour fees or other museum sponsored programs, call (810) 982-0891. The restoration of the tower was made possible by a Save America’s Treasures Grant and a match from the city of Port Huron. The tower is expected to be reopened for tours in the summer of 2012. Once reopened, the Port Huron Museum will serve as a partner in leading tours of the lighthouse. All improvements to the site are being completed with various grants. 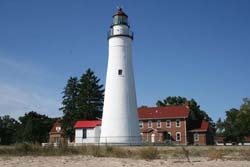 In the fall of 2011, roof repairs were made to the Fog Signal Building and the Equipment Building using grants from the Michigan Lighthouse Assistance Program (MLAP). The matching funds were provided by the Friends of the Fort Gratiot Light. An interpretive master plan will soon be adopted that will serve as a guideline on how the history of the site will be interpreted. The Park is open daily from 7:00am to 10:00pm. Admission to the park grounds is free. Admission tickets are sold in the gift shop for tours of the station and tower. The park is located at 2800 Omar Street, in Port Huron. For more information call (810) 989-6960 or visit the Port Huron Museum’s web page. 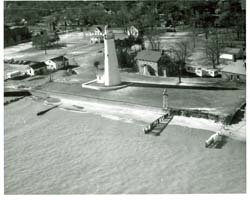 To help support the restoration please visit the Friends of the Fort Gratiot Light's Page. The newest county park is home to the oldest light house in Michigan! As the shipping needs on the Great Lakes increased in the 1820’s, so did the need for a navigational aid at the mouth of the St. Clair River. In August of 1825 the first lighthouse in Michigan was built at Port Huron. The original tower was located near the base of the present day second span of the Blue Water Bridge. It was 32 feet high above ground level, 18 feet in diameter at the base, and tapered to 9 feet across at the top. The original tower did not last long, as poor construction and September storms would lead to its demise when it crumbled in November of 1828. 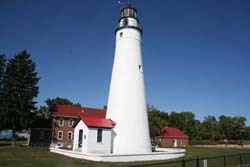 In early 1829, Congress appropriated funds to build the second Fort Gratiot lighthouse. In April of that year, Lucius Lyon was awarded the contract for construction of the new lighthouse. This time the tower was built further north so it could be clearly seen by ships approaching the mouth of the St. Clair River from Lake Huron. Lyon, who would later serve as one of the state’s first senators, contracted with Truman Beecher to construct the tower. Plans called for a 65 foot high tower of stone or brick, 25 feet wide and 5 feet thick at the base tapering to 12 feet wide and 2 feet thick at the top, with an octagonal iron lantern. The plans also called for the construction of a brick or stone keeper's dwelling. The contracted price was $4445, with an extra $55 budgeted for adding the old Argon lamp in the new tower. 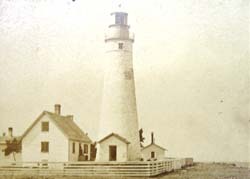 In the 1850’s, The Lighthouse Board began a series of reforms that would affect the Fort Gratiot light. The first such change was the addition of a Fresnel lens. Fort Gratiot’s first Fresnel was a fourth order lens ordered directly from France. It arrived in January of 1857. As the traffic on the Great Lakes increased in the 1850s and 60s, so did the need for improved navigational aids. New towers around the Great Lakes were being built at an average height of 80 to 100 feet tall to improve visibility. In 1862, the tower was raised to 82 feet to accommodate the Fresnel lens’s superior range. That new addition can still be visibly seen today. From the 1860’s to the 1930’s the property expanded with the addition of the Keeper's Duplex (1874), the Fog Signal Building (1900), the Single Keeper's Dwelling (1932), the Coast Guard Station (1932) and the Equipment Building (1938). When most of the Great Lakes lights were automated in the 1930's, the need for light keepers faded into the sunset. The Coast Guard maintained the Fort Gratiot Light Station from the 1930's until they moved next door into the new station that was built in 2004.